If there’s one thing I know about Joanna, it’s that the woman likes her some pom poms (editor’s note: guilty). And who can blame her? They’re festive, easy to make, completely customizable and just downright pretty. That’s why I wasn’t a bit surprised when she asked me to help incorporate these puffy little balls of yarn into her holiday decor this season. I took my inspiration from some beautiful fiber art I saw on my trip to Sayulita this summer (don’t miss Joanna’s travel guide to Sayulita, too! ), and got to work making a modern rainbow’s worth of festive poms. 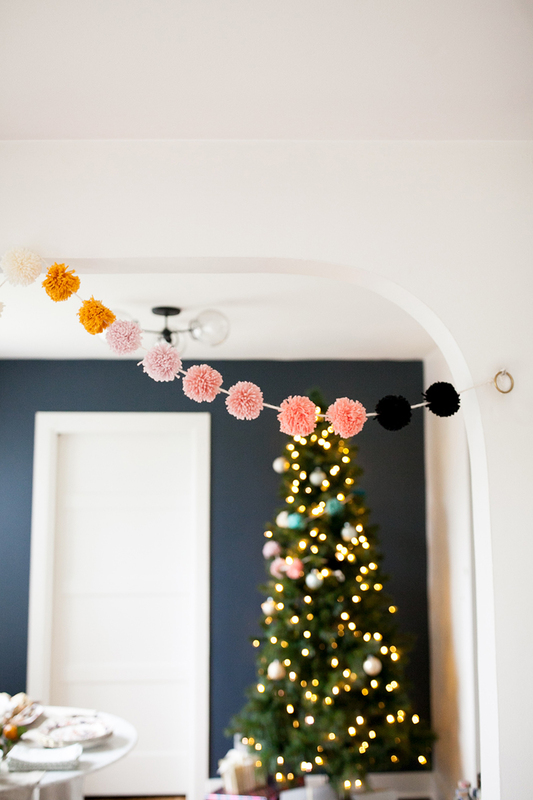 Keep reading to learn how to make this festive pom pom garland DIY! 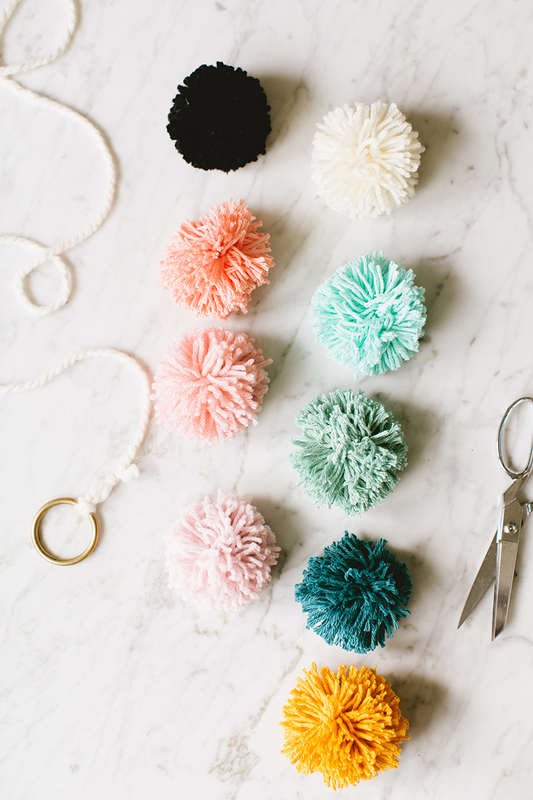 If you plan on making any pom poms ever, I really encourage you to get one of these snazzy pom pom makers. Seriously, it’s a game changer. Here’s what you do: start by swinging open both sets of blue arms (this will look like the shape of an S). Starting on one side, wrap your yarn all the way across the blue arc so you can’t see any blank space. The more yarn you wrap around, the fuller your pom pom will be, so you don’t want to skimp here. Then, close that side and do the same with the other blue arc. Once both sides are covered in yarn and closed, take your scissors and cut down the center of the outside. You’ll feel that there’s a little groove there so your scissors can easily snip in the right place. Next, cut a 12″ length of yarn and slip it into the little groove I was just talking about. Pull it nice and tight and knot it twice (this is what keeps your pom pom together). Now, unfold those blue arms again and then pull apart the pom pom maker like two sides of an Oreo. 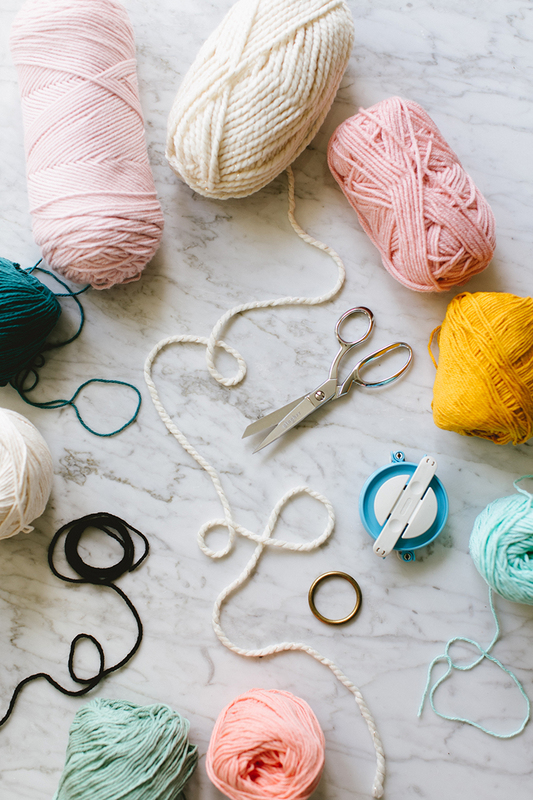 Once you’ve gotten your pom pom free, take your scissors and trim any long or uneven pieces of yarn. 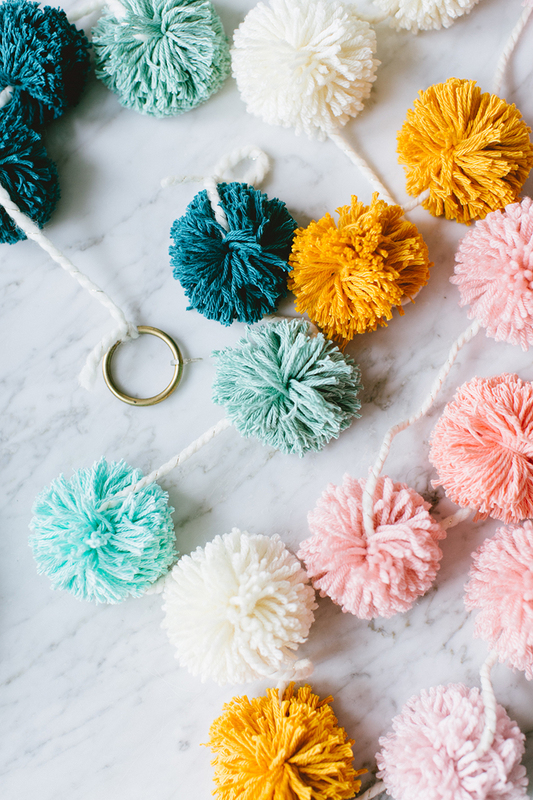 Repeat this process until you’ve made two of each color of pom pom. Cut a length of your stringing yarn (we used one that was slightly thicker and swirled with golden threads) and secure the end to one of your metal rings using a cow hitch knot. 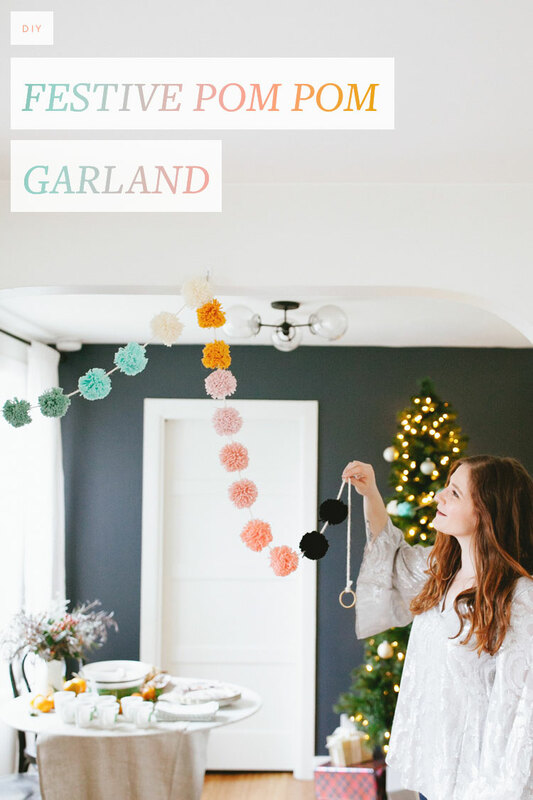 If you know where you’d like to hang the finished garland, I recommend measuring the door frame, etc. so you know exactly how long the string should be. Now, tie the other end of your yarn to a bobby pin — this is a trick I like to use when I need to thread something that won’t fit into a standard needle! Gently thread the bobby pin through the center of a pom pom and slide it down until you’ve reached the end. 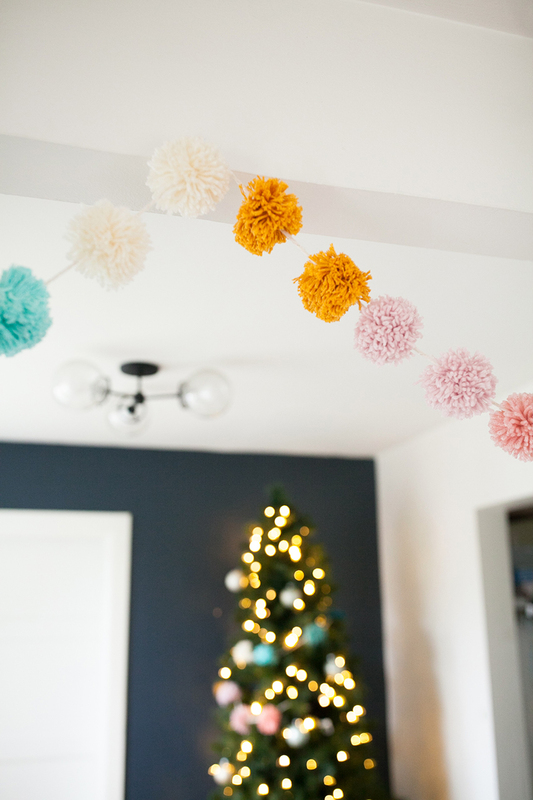 Gradually add all your pom poms, making sure to space them out evenly along the way. Finish it off by securing the end to the second metal ring and making any final tweaks to the spacing. DIY by Homemade Banana for Jojotastic. Find more DIY projects here!